Delicious dinners prepared from organic ingredients and a daily changing menu. The cool, chic look with simple, elegant furnishings that have a touch of luxury all at an affordable price. 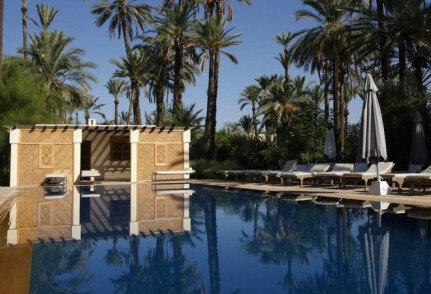 The riad is designed in an understated 1930s colonial chic style with a modern twist. All the rooms are light and airy and the riad has a wonderful feeling of space, unusual in the Medina. The hotel has its own spa area with a private hammam. Sincere and warm English and Moroccan service to ensure that guests feel at home and are well-looked after from the moment they arrive. We personally ensure all guests experience the best of Marrakesh. We provide guests with a mobile phone during their stay and even come and find them if they get lost in the maze of the Medina. For shopaholics/fashionisatas: lots of new boutiques opening up all the time. Yes, we offer freshly prepared meals with organic products bought locally. We are also happy to recommend and book restaurants in and around Marrakech. 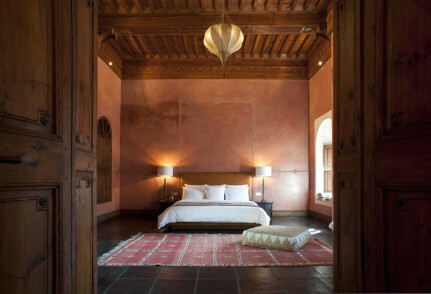 Ebony suite: A beautiful double/triple suite on the upper floor complete with handcrafted menzeh - a traditional Moroccan alcove with hand-turned latticed woodwork. There is also a lovely hand-sculpted wall behind the bed adding to the intimate, classic feel of this suite. This attractive suite overlooks the grand courtyard with its central fountain and pool. Amber superior suite: Beautiful double/triple/quadruple suite on the upper floor with stunning pyramid skylight and romantic floaty four-poster queen-sized bed below it. Perfect for couples and families who appreciate style and space. Topaz superior suite: Totally charming, this double/triple/quadruple suite on the upper floor boasts a fabulous starry domed ceiling and romantic four-poster queen-sized bed. A divine space in which to reflect on your day in the Medina.